We specialize in roll to roll litho printing of laminated and single film applications. We are focused on being a specialty supplier to the flexible packaging and shrink sleeve marketplace in both Canada and the United States. We have been long-time suppliers of printed soup, sauce and gravy pouches, noodles and sauce pouches, and ice cream novelty and sandwich wraps. Our customers range from large multinationals to small privately owned businesses. We are committed to producing products that meet the quality expectations of our many customers and we pride ourselves in providing consistent quality and excellent service. Litho-Pak Inc. is totally committed to being a market leader in environmental preservation. This policy has been in effect for several years. We have a modern, environmentally friendly printing facility. 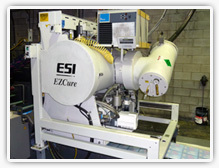 Our electron-beam drying system is leading-edge technology that allows us to dry ink and overlacquer without exhausting harmful VOC’s into the atmosphere! Our plate developing solutions are water-based. We recycle all our printing plates and as much of other packaging materials as is currently possible.